Our rail-trails depend on the dedication of volunteers who give their time and skills to make the Mon River / Caperton / Deckers Creek Rail-Trails a fun and enjoyable place. Maintaining: picking up trash. Check in with us if you need trash bags or gloves. 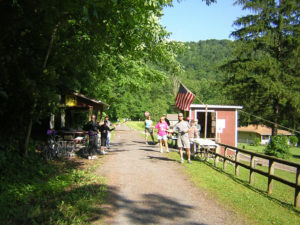 Events: help to organize or staff MRTC rail-trail fund-raisers. The Deckers Creek Trail Half-Marathon, on the first Saturday in June, offers plenty of opportunities to lend a hand. Contact us if you would like to lead and/or organize a fund-raiser for the rail-trails. MRTC can offer assistance in promoting it and recruiting volunteers. Volunteers are the linchpin of the Deckers Creek Trail Half Marathon and Trail Mix Festival. This event celebrates National Trails Day and is the first Saturday in June. We have opportunities for interested volunteers to help out with all aspects of the race and festival, including staffing a water stop along the course, being a lead or follow cyclist, staffing early morning packet pickup, or helping at the finish line and refreshments table. Beyond the many thanks and smiles from runners and the satisfaction of supporting the rail-trails, volunteers earn free race t-shirt. Thank You Deckers Creek Trail Half Marathon Volunteers!! This is the largest fund-raiser for the local rail-trails and we couldn’t do it without you.